The two hurricanes that have ripped through Cuba over the past week have received less than a passing blink from international news organisations. This is in stark contrast to the mountains of press coverage devoted to the evacuation of New Orleans this month. Then again, the American-Cuban relationship has never been balanced. Last week, Hurricane Gustav ripped through the western half of the Cuban island at Category 4 force, while this week Havana narrowly escaped a direct hit by the eye of Hurricane Ike raging initially at the same level, though it was later reduced to Category 1 status. Despite that considerable mercy, Ike ravaged the whole island, from Guantánamo in the extreme east to Pinar del Rio in the far west. Cuba is well prepared for hurricanes, and the government routinely calls for mass evacuations when hurricanes descend. The current death toll lies at seven in Cuba, but the actual and potential destruction belies those figures. Gustav tore out at least 120,000 houses in Cuba’s western provinces, leaving crops and food supplies – already in short supply in a country where rationing still exists – heavily depleted. That was last week, before Ike had screamed its way across Cuba’s countryside and cities. No one yet knows the price Cubans will pay for these hurricanes. Fidel Castro has likened their impact to a nuclear attack. Few images of the country have reached us. 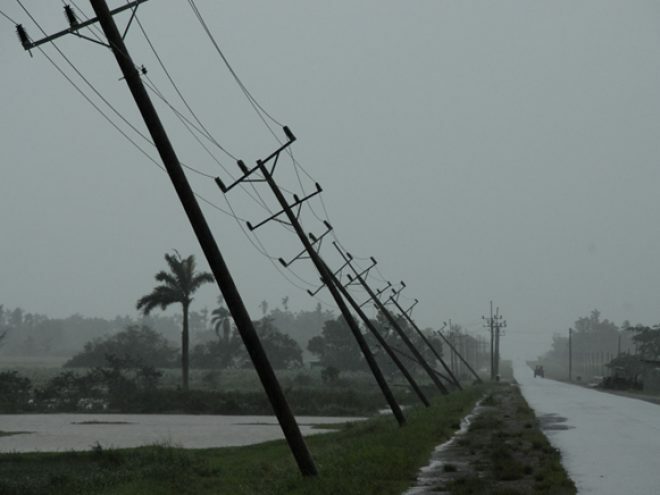 Communications with friends in Havana and the coast were severely limited by the cutting of power supplies, the evacuations to mass shelters and, perhaps more than any other factor, the fear of what was, and is, to come. The Cuban army has been out in force with building materials and food, but the scale of the destruction is vast, and nobody yet knows quite how it will be tackled. Mexico, Brazil, Venezuela, Russia, and even East Timor have offered assistance. George Bush remains ominously quiet. Barack Obama, by contrast, has called for an immediate 90 day suspension of the US-Cuba trade embargo. El Bloqueo, as it is known in Cuba, was imposed on February 7, 1962 by John F Kennedy’s government following the failed Bay of Pigs invasion in which Cuba played its role in the escalation of the cold war between Russia and the US. Cuba’s immediate presence within howling distance of American waters caused such alarm to the US government that it felt compelled to introduce financial, travel and trade restrictions on its island neighbour. In 1992, the US passed the Torricelli Act, also known as the Cuban Democracy Act, since its stated purpose was to bring democracy to the Cuban people. In fact, it forbade American companies from trading with Cuba, prevented foreign ships which used American ports from travelling to Cuban ports for 180 days, interned ships returning from Cuba and, on a human level, banned Cuban families who lived in the US from sending much-needed cash back to their families in Cuba. The hope was that Cuba would suffer an acute economic collapse. In 1996, the Helms-Burton legislation was passed, and Bill Clinton later tightened it further. Among its many strangleholds, it places wide-ranging restrictions on US citizens trading or doing any form of business with Cuba. This law, which the UN general assembly has condemned roundly for many years, applies both to US firms as well as to overseas firms owned or controlled by “US persons”. In 2006, President Bush created a task force designed to enforce and pursue violators of the embargo even more aggressively, with potential penalties resulting in 10-year jail terms as well as huge fines. Over 80% of dairy imports to Cuba consist of milk powder for use in the social programme, imported from New Zealand and the European Union. Rice is shipped from China and Vietnam, taking 45 days to reach Cuba. By way of comparison, it would cost one-third of the price to ship from the United States and would only take two days. Increased transaction costs also affect the import of food. US products must be paid for in advance in cash or through letters of credit drawn on third country banks. The [Cuban] government estimates that incremental (transaction) costs for food and agricultural imports incurred in 2006 due to the embargo amounted to $62.8m. An embargo “to bring democracy” is a tool of warfare, and needs to be recognised as such. Cuba, however, is dealing with enough of her own demons at present. Whirling winds have wreaked a war-like devastation on a land that has stayed determined to seek its own course through history. It is high time the embargo is lifted, not just for 90 days, but for good. According to the Cuban government, the embargo has cost the Cuban economy over $89bn since its introduction and resulted in $258m of losses in the food sector from May 2006 to April 2007. The response from the US government remains dogmatic. Secretary of state Condoleezza Rice has refused to lift the blockade, saying that Bush would be prepared to respond “to a Cuban regime that is prepared to release political prisoners [and] has a process to get to free and fair elections.” She added: “We can see nothing that suggests that has come about.” The irony of both of these comments is extreme: Guantánamo and Florida are close to many Cubans, both physically and emotionally. Neither of those places conjures up the release of political prisoners or free and fair elections. Instead, the US has offered “assessment” by one of its specialists to determine what level of humanitarian relief Cuba will require in the wake of the hurricanes. The Cuban government has refused this offer, asking that the embargo be lifted so that it can buy the materials it needs to help itself. It is time the Americans stopped holding hostages. Democracy can’t be bartered in a capital market, nor imposed in a court of war. If democracy is a tool intended to inspire and help people to determine their own fate, the Cubans need to be allowed both to build and to determine their own. If common sense and fairness cannot prevail upon the US government to change its mind, these hurricanes and the rest of the world certainly should.